After a successful campaign in the 2017 Blancpain GT Series Asia, with ODRacing, Aditya Patel has announced that he will return to this very series for the 2018 season of the championship. The Indian racer will once again compete in the series with the ODRacing team, with Mitch Gilbert partnering him. Patel and Gilbert had an extremely good season last year, starting the year with a victory, and ending it with a double win, but narrowly missing out on the championship by a single point. Given that they had more podiums than anyone else on the grid, over the course of the entire season, this was particularly disappointing. The duo will be hoping to do better this year, with the aim being to win the championship. The ODRacing team will be serviced by Team WRT, known for their success in various forms of GT Racing around the world. 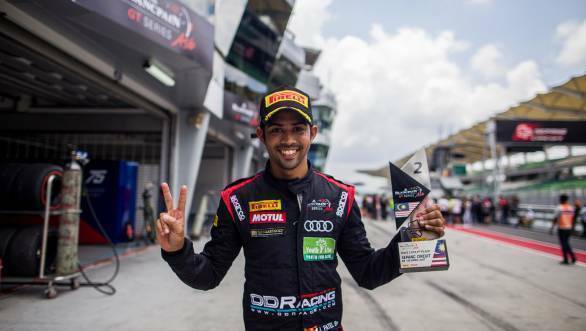 Speaking of his return to the Blancpain GT Series Asia, Patel, who is backed by Audi India, Jubilant Motorworks, and 2Go Activewear, said, "It's a pleasure to be back again this year with OD Racing and Mitch. We may have missed out on the title last year but we are sure we have a strong package this year, with the support from WRT, to be able to fight for the title again. WRT is considered to be one of the best GT3 teams in the world with an impeccable track record and I'm really looking forward to working with them this year! Once again, I must thank Audi India for their continued support over the years!" Meanwhile, ODRacing team boss, Cornelius Ee, said, "Mitch and Aditya proved last year that they are one of the strongest driver pairs in Asia and we now have the opportunity to partner with the renowned race team, WRT, a team that Audi Sport have entrusted to run their factory cars in Europe. Like us, WRT may not have been around for very long but their impressive successes and solid experience with Audi in the European races is sure to be an advantage for us moving forward. ", said ODRacing team boss Cornelius Ee. This season's six-round, 12-race Blancpain GT Series Asia campaign begins at Sepang in Malaysia on April 14/15.